This is my last video blog for 2013 so I thought I would make it fun and light hearted. It makes me happy when…? They had to finish off the sentence and the result was a montage of responses that showcased how the little things in life can bring us some of the greatest pleasures. If you would like a little bit of happiness to lead you into Christmas and the New Year then click on the video below or go straight to the transcript and simply enjoy. Be brave and join in the fun by sharing with others what makes you happy. I will be back on Wednesday 15 January with some more happiness investments. In the meantime I hope you have a lovely Christmas and a wonderful New Year surrounded by love, laughter and friendship. Hi it’s Claire here from the happiness bank and welcome to my weekly video blog. There is only a couple more sleeps until Christmas which is very exciting. I would just like to say a big thank you to everyone who has been following my blog since I started it this year in July. I so love sharing my happiness tips with you each week and I hope that in some small way I have added a bit of happiness to your life over the past six months. This is my last video blog for 2103 so I wanted to make it light and fun and not too taxing on the brain as we all head into holidays and the festive season. So I have compiled a little montage from some of my family and friends who were willing to put it out there and share with you what makes them happy. As you watch this video just have in the back of your mind that the motto of the happiness bank is to make deposits into your happiness account every day so that when life gets tough and you have to make some withdrawals you have a good solid foundation of happiness to draw from. So here we go I am going to start the ball rolling. I am hanging out with positive happy people. I hope you enjoyed watching and listening to that. Every one of those people are depositing into their happiness account every day as they do these things that bring them happiness. What makes you happy? I would love to keep the deposits flowing by getting you to share with others what makes you happy. All you have to do is finish the sentence “it make me happy when…” in the comments below. 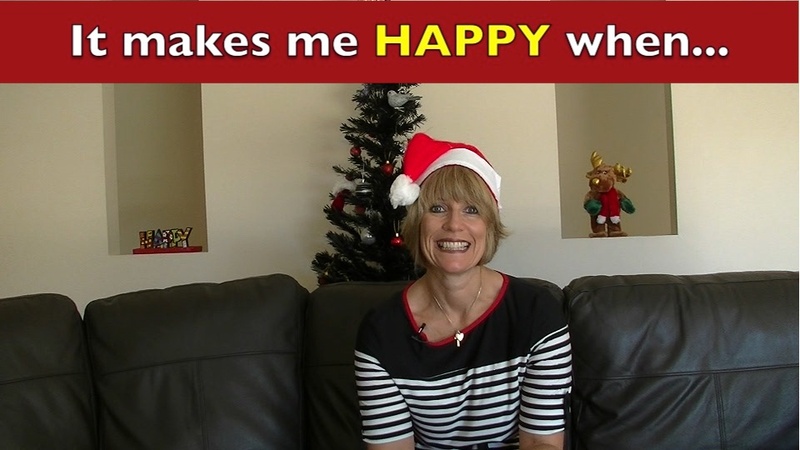 Have an awesome Christmas and a wonderful new year and I will see you back at the Happiness Bank with my first video blog for 2014 deposited into your in box on Wednesday 15 January. So if you haven’t signed up already please pop on over to happiness bank.com.au and subscribe now so you can kick off the new year with some happiness inspiration. Together we can all continue to colour this world with health and happiness. I fell happy when my hubby makes me laugh out loud! That just made me smile – thank you! Thanks heaps Deanne, so glad it did. Love it when it does what it is intended to do.